By the age of 14, Bruno Lopez knew he wanted to be a chef. He would stand side-by-side with his mother in their Parisian kitchen preparing watercress soup, roast and apple tarts for his father and brother and sisters. Unlike most French chefs who follow their father’s footsteps into the kitchen, Lopez was the first in his family to make the culinary field his future. After graduating from high school, Lopez trained at the Ferrandi School in Paris and apprenticed at L’Espadon, a Michelin one-star restaurant at Hotel Ritz in Paris. Honing his culinary skills in France in such places as Versailles for 3 years and South America during his Military Time, he decided to take his talent to San Francisco where he joined the Le Meridien Hotel as Chef de Cuisine at Pierre Restaurant. Following his tenure at Le Meridien, Lopez joined The Ritz-Carlton, San Francisco as Executive Sous Chef. 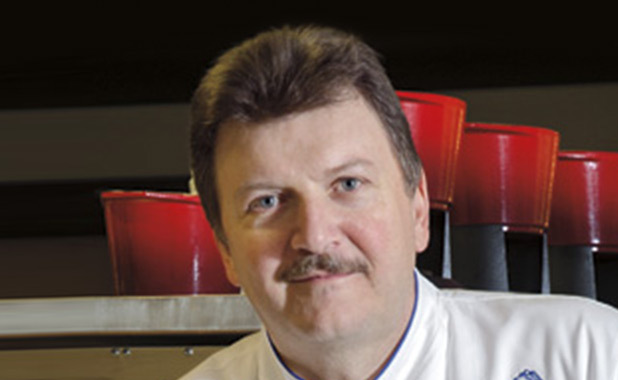 He remained with Ritz-Carlton for 10 years as executive chef in Marina del Rey, Dubai, and Half Moon Bay. Prior to joining the Bel-Air, Lopez’s culinary experience included positions as the Executive Chef at Raffles L’Ermitage Hotel in Beverly Hills and the Regent Beverly Wilshire. Lopez joined Executive Chef Dodd as Chef de Cuisine in The Restaurant at the Bel-Air in February 2005. Together they focus on showcasing the unique culinary offerings of California, including fresh seasonal vegetables, meats and cheeses, which are signature ingredients at The Restaurant at Hotel Bel-Air. In 2004, Lopez was recognized by the French government as Officier de L’Ordre Du Mérite Agricole. Lopez is a member of Confrerie de la Chaine des Rotisseurs, Club Culinaire of Los Angeles, Les Toques Blanches International, the James Beard Foundation, L’Academie Culinaire de France since 2005 and the Prestigious Association des Maitres Cuisiniers de France ( French Master Chef) since 2008, with only 350 members worldwide.